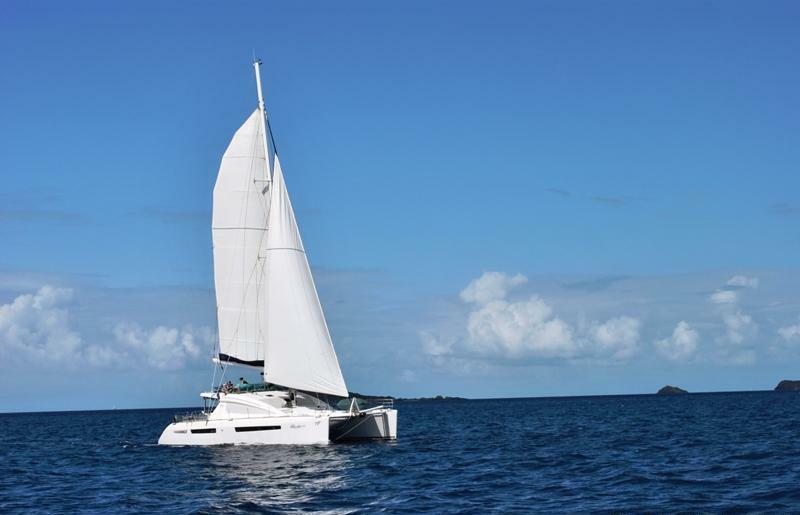 Jeri is a 61.5 ft Privilege luxury crewed catamaran available for private charters throughout the Caribbean. Jeri welcomes her guests to a world of style & elegance, good company and great food. 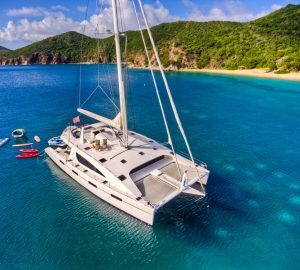 Designed for comfort, performance and safety, this Privilege 615 luxury catamaran is one of the finest crewed yachts available for charter in this size range. 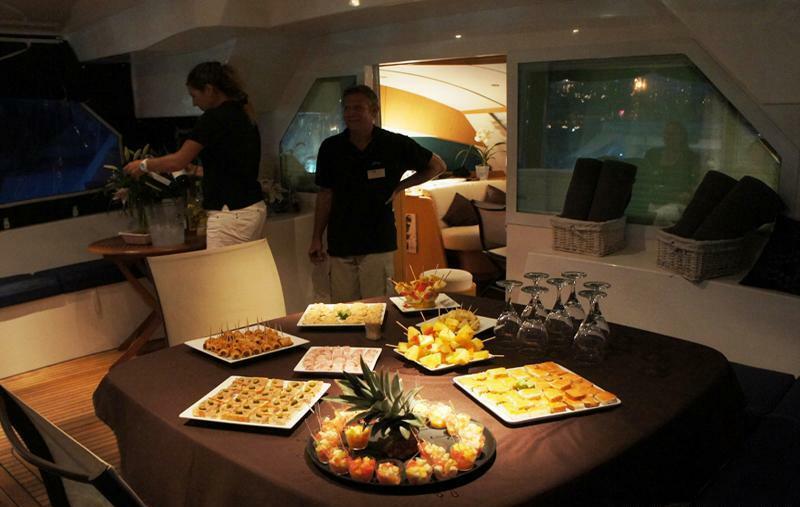 JERI offers her charter guests three luxurious guest cabins and one beautiful and spacious owners suite. 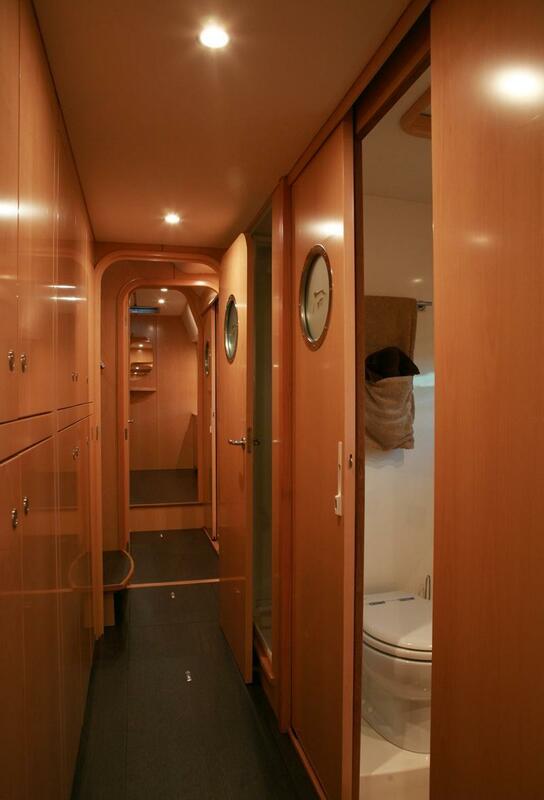 Each guest cabin features in room television & DVD, individual climate control, a settee, dressing table with mirror, expansive storage space including hanging locker, 110V & 220V electric sockets (European & American) and private ensuite bathrooms featuring a separate shower with water jets and electric toilets. 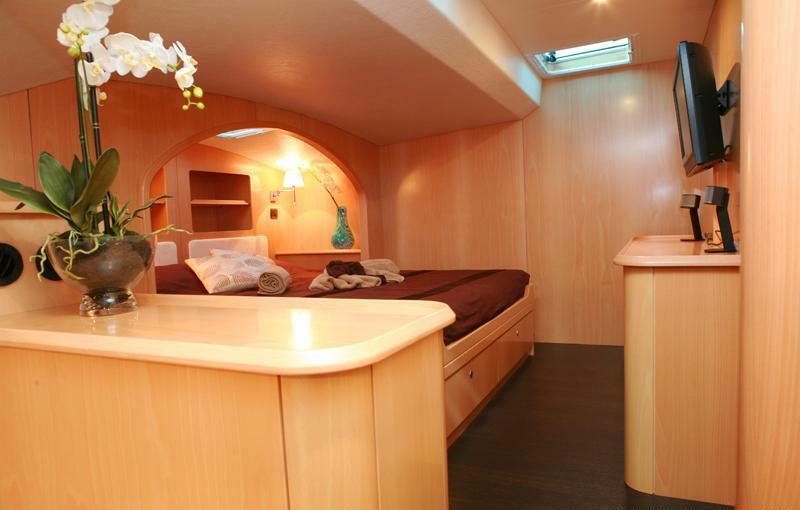 The master suite is located forward Portside and features a walk around king size bed (approx. 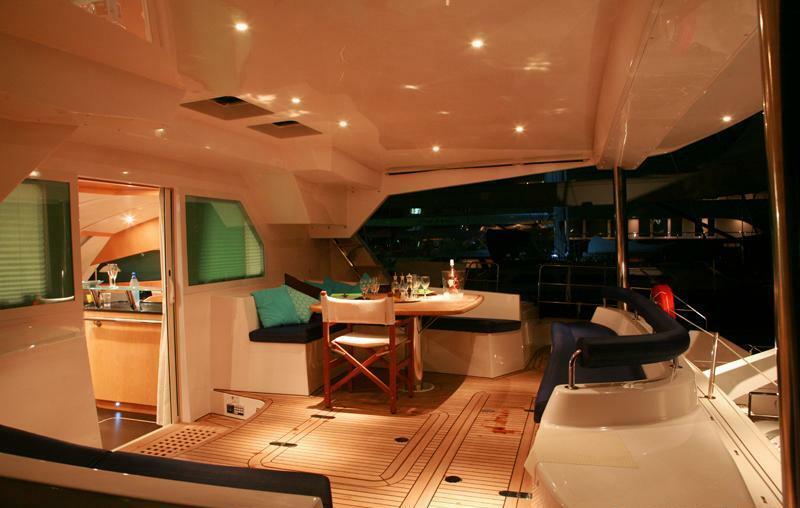 7ft 8 inch x 7ft), as well as an in room computer with access to WIFI and the boats satellite communication. 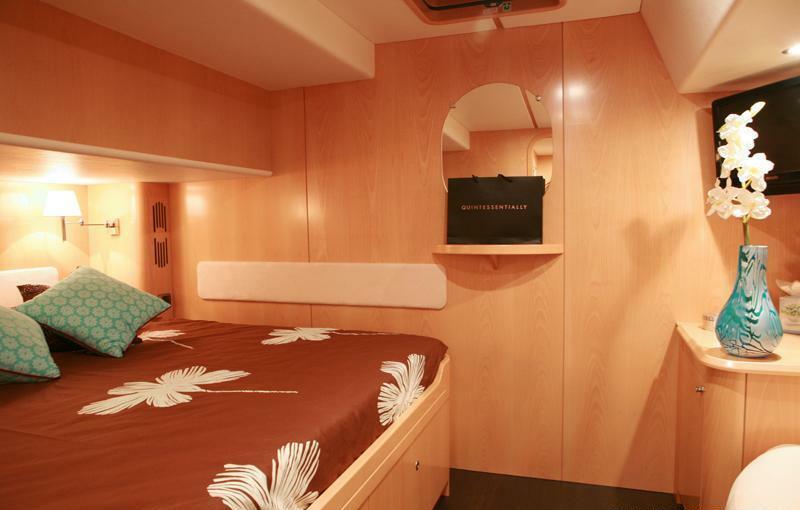 The VIP cabin located aft portside features a king size bed (approx. 7ft 8 inch x 7ft). 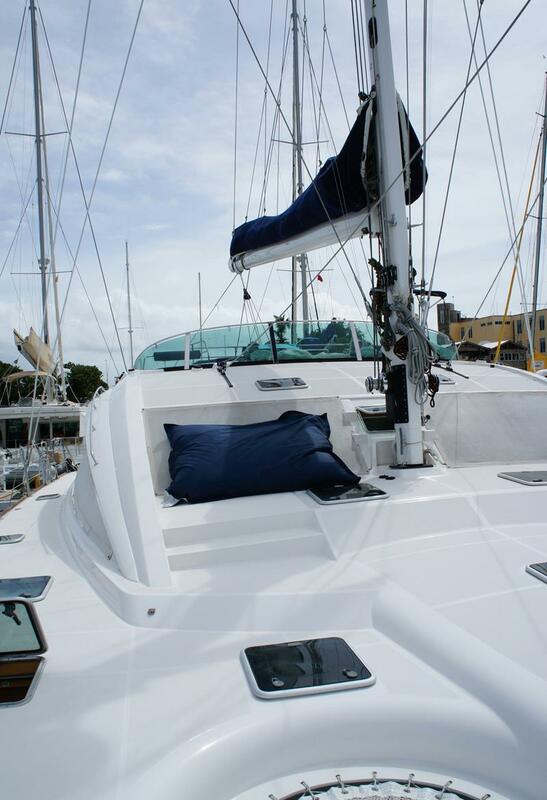 Located on the Starboard side aft is a third guest cabin featuring a queen size bed (approx. 7ft 8 inch x 6.3ft). This bed can be converted into twins. The fourth guest cabin which features the smallest square footage located on the starboard side forward features a queen size bed (approx. 7ft 8 inch x 5.8ft - two single mattresses). Jeri offers her guests plenty of area to relax and enjoy the sunshine. Her expansive deck has loads of room for guests to spread out and relax. 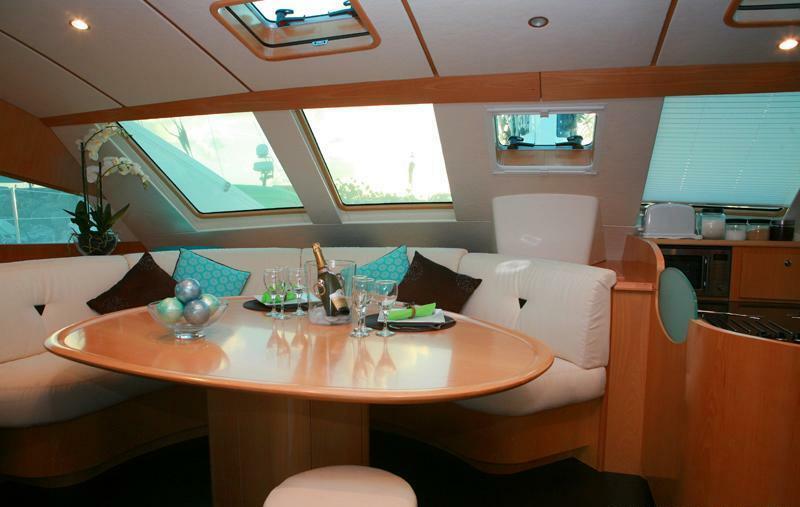 From her large foredeck to her spacious cockpit with alfresco dining this catamaran has everything one needs for a luxury charter. As well has her expansive deck Jeri has a fly-bridge offering yet other place to hang out and soak up the warm sunshine. Her salon features another dining area if guests require a more formal setting or wish to escape the heat for an afternoon nap or perhaps a movie. 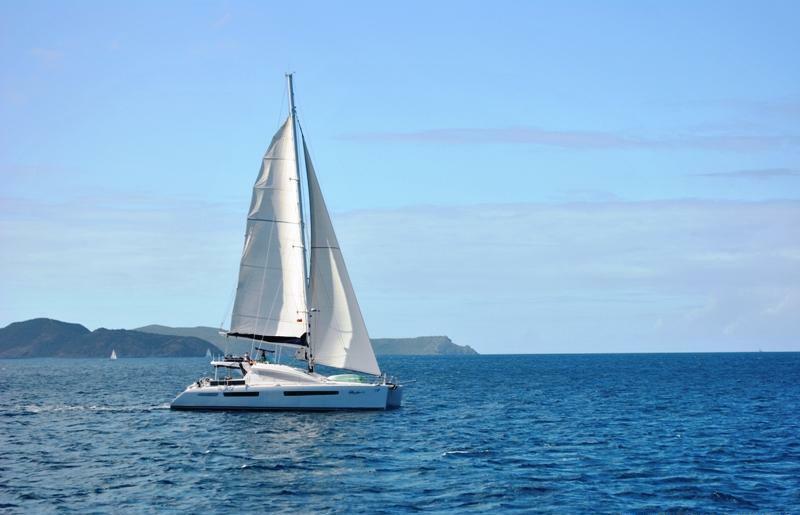 Jeri’s professional crew are very experienced in the Caribbean waters and look forward to welcoming guests on board Jeri for a vacation of a lifetime. 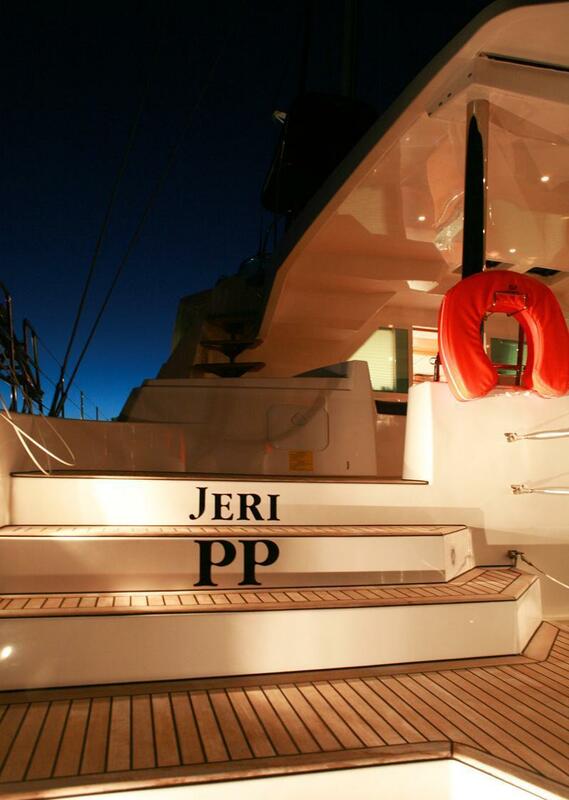 Jeri features 4 staterooms each with their own private ensuite bathroom offering separate shower and head facilities. Her four staterooms include a stunning master suite with office area, a VIP cabin with a King size bed, a queen cabin that can convert to a twin and another queen cabin. 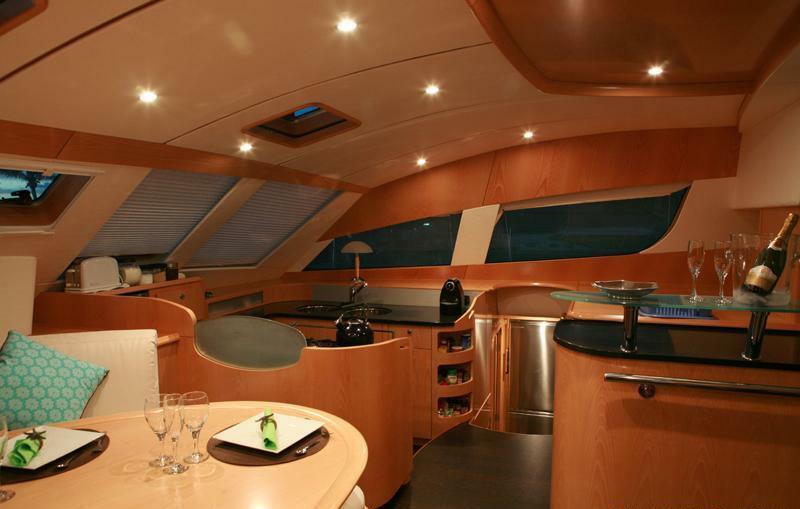 As well has her four staterooms she features a stunning salon with formal dining and a wet bar as well as a lounge area. The Salon opens to the cockpit which features alfresco dining table and sun pads. Jeri comes with a host water-toy’s for guests to enjoy on charter; including water ski’s, wakeboards, Kayaks and a vast array of floating toys for guests to enjoy. She has a 15ft tender with a 40ft outboard perfect for moving guests ashore in comfort and style and ensuring lots of fun on the towable toys. 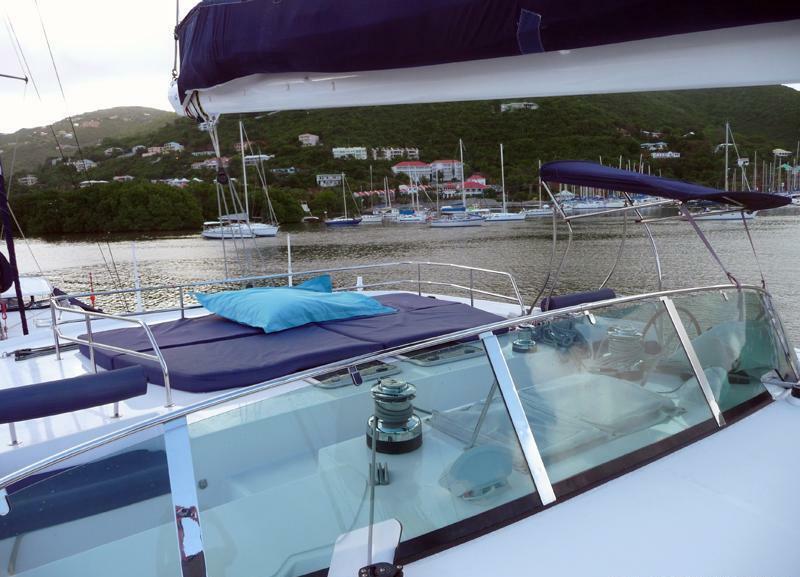 Dear Trina, We returned from our BVI cruise aboard Jeri and what a wonderful vacation we had! The boat was maintained impeccably and suited our needs perfectly. The spaciousness of the master cabin was unbelievable. What made this trip unique was how Sophie and Alain catered to our every wish… How Sophie manages to turn out gourmet meals on a boat is amazing. Her cooking is superb, varied, and she always kept our dietary needs in mind. Alain was always willing to sail and in addition to taking us wherever we wanted to go, he often had good suggestions regarding beaches and snorkeling. He gladly accompanied us with the dingy to make my husband feel more at ease when the snorkeling was not near the boat. He was happy to "talk" sailing with my husband and to explain some of the boat's systems to him. Both Sophie and Alaine were warm and likeable and we enjoyed just visiting with them. 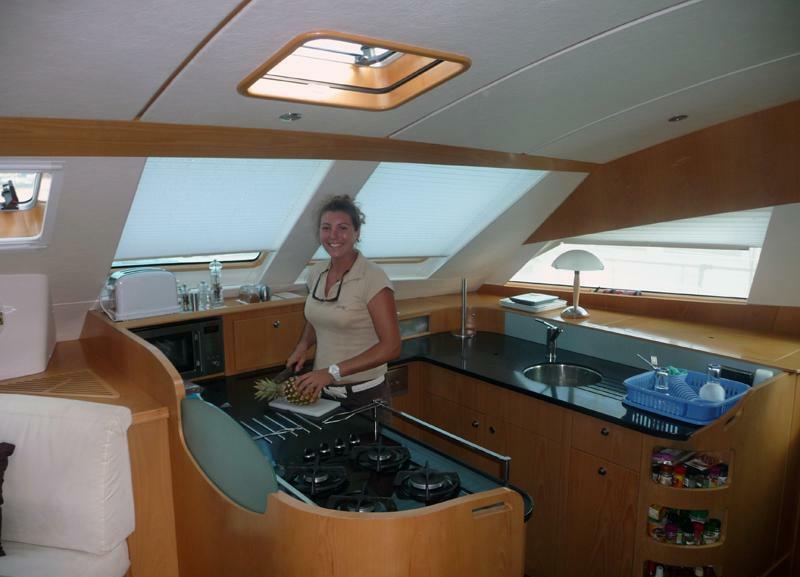 We highly recommend Jeri and her crew to anyone who wants a 5 star sailing adventure. Thank you, Trina, for all your help and we are considering the possibility of a future charter.. We will certainly call you if we decide to pursue this idea. 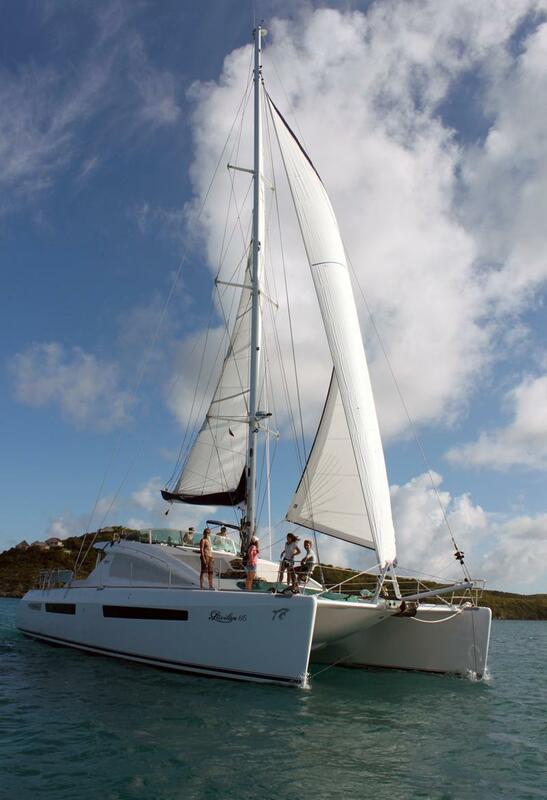 Charter on catamaran JERI in BVI June.